Since 2008, Void Watches has produced affordable watches that showcase designer David Ericsson's sparse, modernist aesthetic. The Time Bum has reviewed the analog V03D and the plastic digital Sond, and found them both to be stylish, appealing watches. Now, Ericsson has revisited the very Void watch, the V01/V01EL, a digital LCD in a boxy, stainless steel case. This futuristic timepiece has become Void's signature model but the future keeps on coming, and after 7 years, it was time for an update. Enter the V01 Mark II, a sleeker version of that original design that incorporates a number of improvements. The new watch maintains the VO1's 36x42mm dimensions, but the thickness is reduced to 8.4mm for a difference that is immediately apparent. The new case wears a matte, sandblasted finish and is now water resistant to 50 meters. The high contrast LCD is protected by a sapphire crystal. The new straps are slightly slimmer (22mm instead of 24mm) and are made from premium grade Italian leather with calf leather lining and custom-made stainless steel buckles. Color choices remain the same: black, silver, and gold. At $340, the V01 Mk II is not cheap, and is significantly more expensive than the $195 VO1EL, which currently includes an extra strap. Still, the new model is not unreasonable and represents a significant improvement over its predecessor. 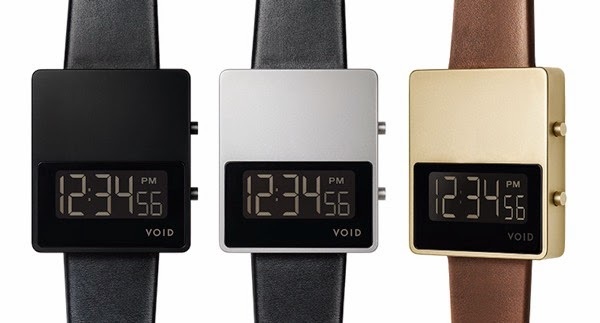 If one of these slick digitals is in your future, you can purchase directly from www.voidwatches.com.